How can I register NoteBurner programs with registration code provided? Once your order has been validated, registration code will be sent to your e-mail INSTANTLY. Then you can simply download and install the program you purchased on your Windows or Mac computer to register it. 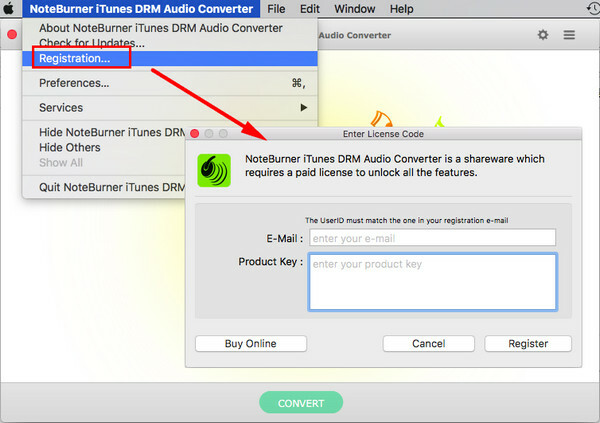 For Mac Users: Install the trial version of NoteBurner iTunes DRM Audio Converter for Mac on your Mac. Then launch NoteBurner. Click the menu bar "NoteBurner iTunes DRM Audio Converter (on the upper left of the screen) > Registration". There will be a registration popup dialog, where you can copy and paste the User ID and Register Key. Note: The User ID is case sensitive. Please do not add blank at the beginning or the end of the word. For Windows Users: Install the trial version of NoteBurner iTunes DRM Audio Converter for Windows on your PC. Then launch NoteBurner. Click the Menu icon (on the upper right) > Register". There will be a registration popup dialog, where you can copy and paste the User ID and Register Key. 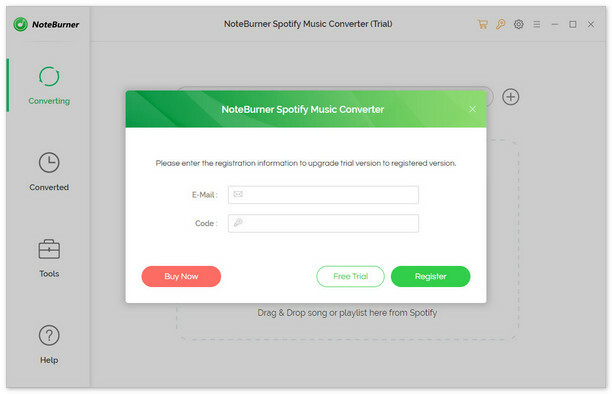 For Mac Users: Install the trial version of NoteBurner Spotify Music Converter for Mac on your Mac. Then launch NoteBurner. 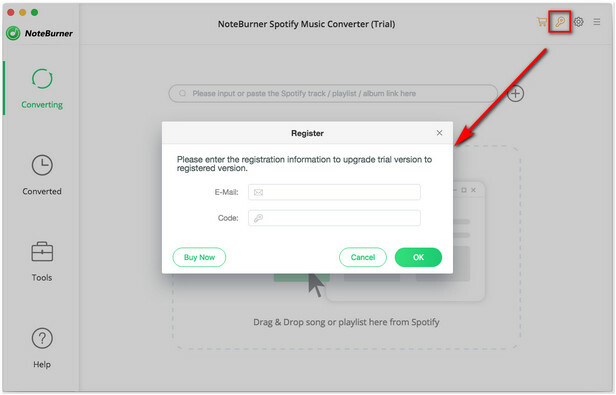 Click the menu bar "NoteBurner Spotify Music Converter (on the upper left of the screen) > Registration". There will be a registration popup dialog, where you can copy and paste the User ID and Register Key. For Windows Users: Install the trial version of NoteBurner Spotify Music Converter for Windows on your PC. Then launch NoteBurner. Click the Menu icon (on the upper right) > Register". There will be a registration popup dialog, where you can copy and paste the User ID and Register Key. For Mac Users: Install the trial version of NoteBurner M4V Converter Plus for Mac on your Mac. Then launch NoteBurner. Click the menu bar "NoteBurner M4V Converter Plus (on the upper left of the screen) > Registration". There will be a registration popup dialog, where you can copy and paste the User ID and Register Key. For Windows Users: Install the trial version of NoteBurner M4V Converter Plus for Windows on your PC. Then launch NoteBurner. Click the Menu icon (on the upper right) > Register". There will be a registration popup dialog, where you can copy and paste the User ID and Register Key. What to do when get the message shows "Invalid Code"? 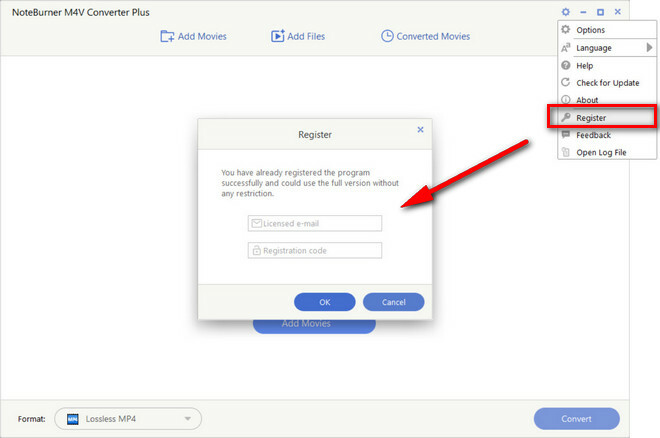 As for this case, you need to check the full name of the program to see if it is the exact program you want. NoteBurner provides with seven pieces of different products. You can view our product page to get full information about them. 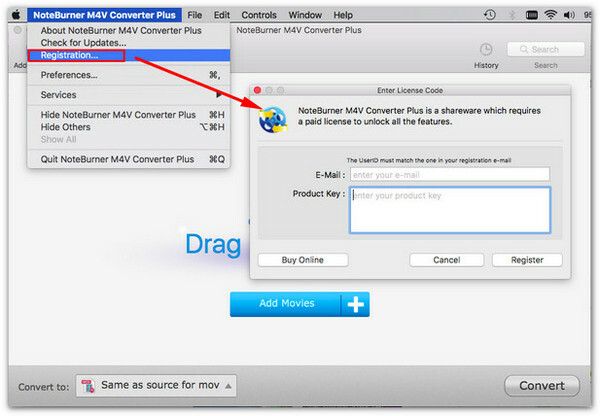 Please note, M4V Converter Plus is not the same as M4V Converter. If you have downloaded an incorrect program, the register code will be invalid as a result. To resolve this problem, you can check your order receipt and then go to our Download Center to download the correct one you have purchased. support [at] noteburner.com (replace [at] with @ before sending message).